TASHKENT (UzTAG) — Uzbekistan and Kazakhstan plan to create a unified platform for exchange trades. 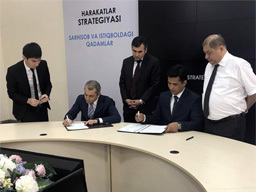 The agreement follows the signature in the capital of Uzbekistan, a Memorandum of Understanding (MoU) between the Kazakhstan Stock Exchange (KASE) and the Republican Stock Exchange Toshkent (RSE). According to RSE, the signing of the memorandum between the two stock exchanges is the next step in establishing long-term relations and implies the exchange of experience and information on the activities of markets and securities transactions. RSQE believes this agreement will contribute to improving the capital markets of both countries and demonstrates the expansion of cooperation in the financial sphere between Kazakhstan and Uzbekistan. Further steps to develop cooperation between the stock exchanges will be taken around the organization of a single site for conducting exchange trades to create investment channels between countries. The Kazakhstan Stock Exchange was established on November 17, 1993 for the organization and development of the national currency market. A few years later, it was renamed the Kazakhstan Stock Exchange. The Republican Stock Exchange Toshkent was established on April 8, 1994 in accordance with the decree of the President of the Republic of Uzbekistan On measures to further deepen economic reforms, to protect private property and develop entrepreneurship of January 21, 1994, No. 745. The activities of the RSE are closely related to the reforms being carried out in the republic and the policy of creating joint-stock companies of an open type based on privatized state enterprises.